Last night I dreamt Hitchcock tipped his hat to Selznick. In a recent poll I conducted on the Alfred Hitchcock Geek Facebook fan page, the director's spooky Gothic melodrama Rebecca (1940) stood out as a perennial favorite among Hitchcock fans. I agree with them. Rebecca is a classic Hitchcock thriller. For those two reasons, I tend to get impatient with the common assumption -- fueled by Hitch himself -- that Rebecca and his other David O. Selznick-produced films are somehow less "Hitchcockian." To the contrary, I think that movie was a watershed for Hitch, adding undiscovered depth to his storytelling abilities. Selznick had lured the director to America in 1939 to fulfill a seven-year contract. Before long, however, the producer and the director were at loggerheads. Hitchcock was a product of the British studio system, where producers took a hands-off approach to creative matters, entrusting them to the director. The American Selznick, by contrast, was used to operating in a world where producers exerted creative control and directors were often little more than project managers. As a result, though Hitchcock enjoyed greater access to larger budgets, star talent and other resources, his move to America must have felt a bit like a demotion. Still, regardless of their culture clash, Selznick did hire him to handle a very specific kind of movie at which the director excelled: the psychological thriller. The producer relentlessly pushed his new hire to adhere to his vision of the film, provoking Hitch to find ways thwart those efforts. For instance, he avoided shooting extra footage that Selznick could then manipulate in the editing room. In spite of his authority on the set, Hitch hated confrontation and went to great lengths to avoid it, thus his sneaky, passive-aggressive subterfuges make for great entertainment. Yet, even if he'd rolled over and not pushed back at Selznick at all, I suspect that the resulting film would still be very Hitchcockian -- because, ultimately, that's what his boss wanted and paid him to deliver! Both men were brilliant filmmakers. Selznick had risen up through the Hollywood ranks as a story editor and knew his way around script and soundstage. The success of his Gone with the Wind, released months before Rebecca, was due to in large part to his obsessive control. Thus, their conflict wasn't between the artistic demands of a director and front office "bean counters," but rather between two seasoned, successful creative professionals, both of whom had earned their right to a certain amount of egotistical swagger. 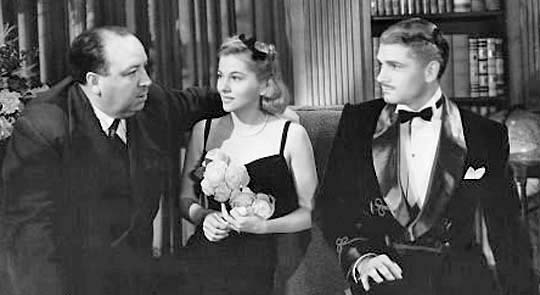 Hitchcock actually grew under Selznick's guidance, specifically in the area of characterization. A supremely visual thinker, Hitch tended to think in terms of suspenseful or amusing episodes. His characters were often props, more-or-less , employed to move the story from one entertaining scene to the next. Rebecca departed considerably from that formula, taking Hitch deeper inside its main character, Mrs. DeWinter (Joan Fontaine) than he had ever gone. The result is a deeply moving film that earned Fontaine as well as Laurence Olivier (who played Maxim DeWinter) and Judith Anderson (as the immortally creepy Mrs. Danvers) Oscar nominations for their respective roles. And, oh yes, it also won the Academy Award for Best Picture. Stubborn though he may have been, the lesson of characterization wasn't lost on Hitch. It's hard to imagine that he could have plumbed the depths of such future characters as Ingrid Bergman's Alicia Huberman in Notorious (1946) or Doris Day's Jo McKenna in The Man who Knew Too Much (1956). If you want to chart Hitch's growth in this area, simply compare the characters in that latter movie to his original version, made in 1934. Both are brilliant films, but as Hitch himself described them to Francois Truffaut, "the first version is the work of a talented amateur and the second was made by a professional." Of course, credit must go to his writers for adding nuance to these and other characters; at the very least, Hitch had enough sense to bring in writers who could make up for what he may have lacked. In other words, Hitchcock, whose films had always contained healthy dollops of psychology, became, under Selznick, more psychological than ever. Thanks to Selznick, Hitchcock dug deeper, expanding his narrative vocabulary, ultimately making his films more Hitchcockian than ever. Creative conflicts arise all the time between talented, passionate artists. Despite those tensions (maybe even because of them), the final result can sometimes be a better work of art than would have otherwise been produced. Case in point: Rebecca. Enjoyed watching Rebbecca AGAIN, with your observations in mind... "I broke the china cupid" revelation of New Mrs. D breaking china cupid symbolize "I's" destruction of the myth & fragility of the artificial love of original Mrs. D? New Mrs.D. initially replaces the mythological Mrs. D by substituting in the same role...new hair style, wearing pearls, throwing costume ball, wearing dress from portrait. With each new revelation that undermines the myth, the new wife, develops her own identity as Mrs. D.